I really love outdoor dining and today I have a grill and a recipe that gets everyone involved in the cooking experience. The Shinwa Grillis a self-contained dining experience. The grill itself, which comes in either a charcoal or electric version, is basically a cooktop surrounded by a dining table that seats from four to six people. It’s like a home version of a tappanyaki grill seen in Asian restaurants. 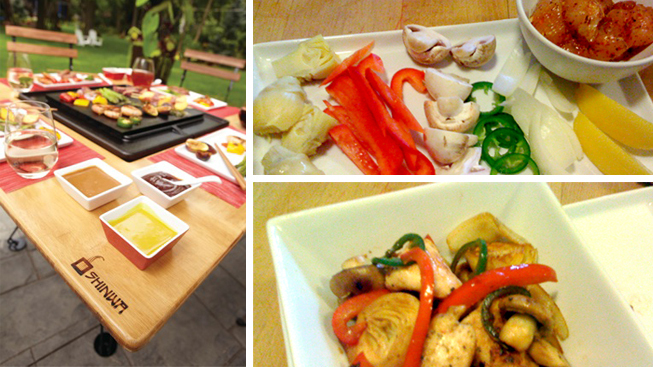 You and your guests grill your own fresh ingredients while socializing and enjoying each other’s company. And, by using fresh meats and vegetables with light sauces, you can create healthy and flavorful meals. I experimented with the Shinwa Grill recently and created this chicken and artichoke dish. Served over brown rice, it’s light and tasty. With the jalapeños and spice mix, it has a bit of kick to it. But, feel free to remove or substitute any ingredients you like. 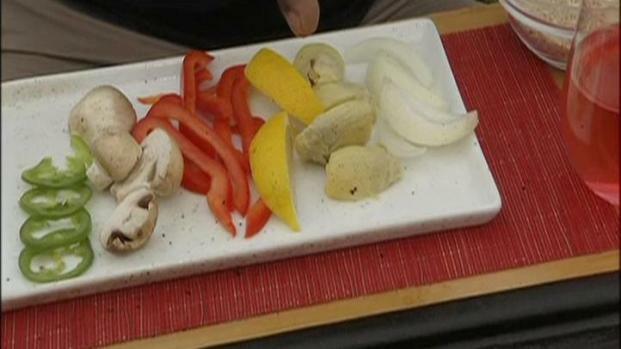 Wayne shows you how to grill at your dinner table to impress your dinner guests. Roughly chop 4 of the onion sections and sauté them in the butter in a medium pot over medium high heat for about 4 minutes. Add brown rice and Worchestershire sauce and stir to coat. Add water. Reduce heat to a very low simmer. Cover pot and cook for 40 minutes until rice is tender. Remove from heat and store rice in an airtight container until ready to use. Place chicken pieces in a sealable bag. Add olive oil, garlic and grilling spice mix. Seal bag and shake ingredients vigorously to thoroughly coat the chicken. Remove as much air as possible from the bag and reseal. Place in the refrigerator and marinate for two hours to overnight. Divide remaining ingredients among four individual plates. Divide rice into four separate serving bowls. Divide the marinated chicken into four small bowls (don’t put on the same plate as the vegetables). Give each guest a plate of vegetables, rice and chicken (these steps are for using a community grill like the Shinwa Grill…I have stirfry instructions, for preparing this dish in a wok, below). For preparation, place the chicken pieces on the prepared grill with a little oil. Sear each side for 2 minutes. Add the red peppers and mushrooms and sauté for an additional minute. Add the jalapeños and artichokes and continue to sauté until all the ingredients are tender, about 10-12 minutes total. Squeeze lemon on all the ingredients and then transfer them to the individual serving bowls on top of the brown rice. Give your guests salt and pepper to season to taste. If you aren't using a community grill like the Shinwa Grill, this dish can be stir fried in a wok. Heat the wok to a high temperature and add oil and the chicken. Follow the instructions above for the remainin ingredients and then serve the dish over brown rice as well. If you’d like more information on the Shinwa Grill, go to their website at www.shinwagrill.com. If you have any questions or comments, please send me an email at wayne@waynesweekend.com or follow me on facebook.